The Vue smartglasses are not like other smartglasses. Ironically, there's absolutely nothing to see when you put them on; all of the smarts are done through audio, meaning the frames and lenses are just there to keep everything strapped to your face. "I think glasses is one of those form factors, unlike many of these hearables, that people are super familiar with," says Vue co-founder Aaron Rowley as I try on the latest prototype. The number of glasses wearers in America is estimated to be just north of 60%, and that's the population Vue is targeting first. So what do they actually do? There are two main components: fitness and audio smarts. Fitness is your basic step tracking, calorie counting, distance measuring through the day. More interesting are the audio smarts, which use bone conduction audio to bypass the eardrum, letting you hear sound through the frames of the glasses. Vue's certainly not the first to do it, but I still find bone conduction audio to be a little magical - even Taylor Swift's latest single couldn't take that away from me, as I tested the music player. What's more, unless you turn up the volume really loud, you needn't worry about other people listening in. You can also take phone calls and speak to Siri or Google Assistant, depending on which smartphone altar you worship at. 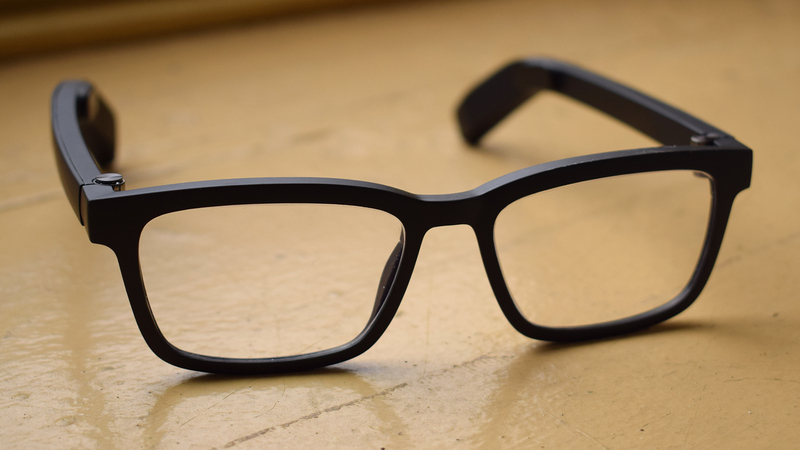 On the side of the glasses are touch panels which you can tap to answer incoming calls, speak to your smart assistant, or just check how active you've been. I gave the right side a couple of taps and a voice told me how many steps I'd racked up so far that day. You'll get three days of battery life if you're only using the fitness tracking (which I can't imagine many people would) and five hours of continuous audio. I wasn't allowed to photograph the working pair I tried on; that's a dummy model you see in the photos, but beyond some haphazard tape holding bits together, the difference was negligible. So, back to who's actually going to use these. My obvious question to Rowley is whether Vue has any interest in non-glasses wearers as well, and if so, why not just make a hearable in the vein of the Bragi Dash Pro or Doppler Here One? "We did see significant percentage of people in our pre-orders that don't wear prescription," he says, "and actually interestingly enough in the US the fastest growing lens type is non-prescription lenses, so you're seeing this shift in the glasses market where people are starting to buy eyewear as more of a fashion accessory." Perhaps the answer is really about what comes next. When the Vue glasses ship later this year they won't have any fancy AR tricks, but Aaron says that stuff is something that could later be added once the tech is ready. "We're taking a few steps back from what you saw previous products in the market do, when they were heavy and bulky and had all these features - and start really simple," he says. "Hopefully we'll shift people to thinking of smartglasses as a cool normal thing, and then build up from there with advance technologies. So we think starting simple and building up is the right way to go, and for that reason we've intentionally left out cameras, augmented reality, because we think that would just scare too many people away right now because the experience isn't ready to go." After raising more than $2 million on Kickstarter last year, Vue is preparing to ship by the end of 2017, and then in early 2018 move to direct sales. For that, it's planning to sell the glasses for $299 which would include a basic set of single-vision prescription lenses. For an additional cost it will offer other lenses - blue light filter, polarized etc. They're not quite finished though. Aaron says they're still working to improve the audio so that it's less likely to leak at higher volumes. "But it's also important to get the message out there that this isn't quite a high fidelity audio experience in the same way noise cancelling headphones might be," he says. Vue's positioning its glasses as fashionable tech, a move that played well for Snap when it launched Spectacles; both companies want to shake off the shadow of Google Glass. "I still think the one thing that was missing was just that thoughtful design," says Aaron about Snap Specs. "You wear Spectacles out and you see the camera. People see that and they know they're not normal glasses." Vue certainly has the design, but I question whether there's enough here for people, glasses wearers or not, to want to keep them on their face all day long. $2 million says I'm wrong - we'll find out soon enough.